Onslaught of digital commerce has perpetually changed the retail landscape. Brick-and-mortar stores are stuck in the conundrum of closing the doors or embracing omnichannel commerce. However, this is just the start of digital disruption. To differentiate themselves from the competitors, retailers must enable data driven in-store transformation and deliver customized experiences that customers expect. Acquire near-real-time view of key in-store metrics like traffic, sales, and engagement. Measure sales conversion by co-relating traffic inflow with the number of transactions and value of transactions. Leverage insights derived from footfall analytics to plan store workforce needs. Analyze store performance, optimize campaign strategy, improve assortment, and make better merchandising decisions. We help our clients address all the challenges related to change management, technology implementation, and workforce management to maximize the ROI of smart in-store analytics solutions. 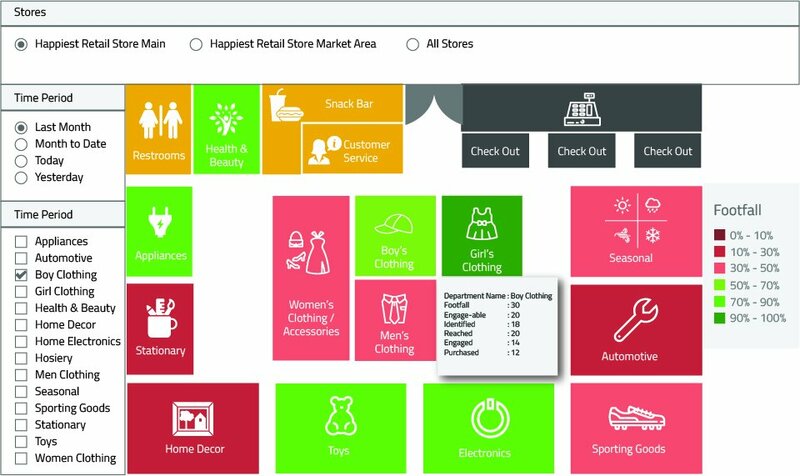 Our In-store Analytics solution, which is available on cloud and on-premise, leverages digital technologies like mobile, beacon/ location tracking devices, video based people counting, and advanced analytics to monitor and improve in-store efficiency, increase employee productivity, and sales.